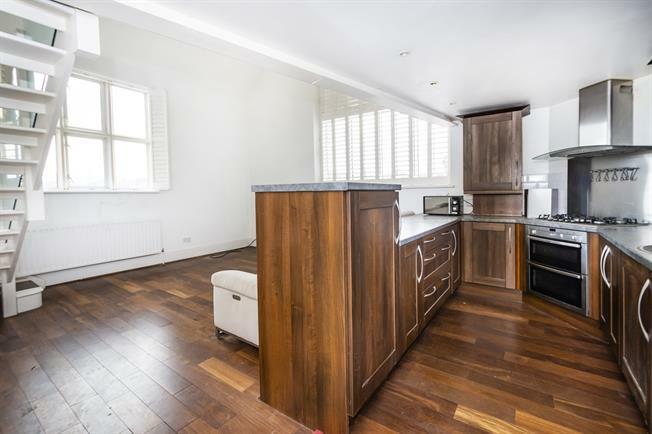 2 Bedroom Flat To Rent in Kingston upon Thames for £1,800 per Calendar Month. A well-presented two bedroom apartment with a 270 sq.ft. roof terrace set in a prime North Kingston location. The property comprises two bedrooms, both with plenty of built in storage space and one being en suite, a main bathroom, a contemporary open plan kitchen/dining/reception room with large, dual aspect windows, and a spacious mezzanine lounge area above with French doors leading out onto the west facing roof terrace. The property also has one allocated parking space.